In addition to the physical toll experienced by children with serious medical problems, there are usually emotional difficulties that are harder to see and even harder to ease. And when a child is afraid or confused, feels hopeless and helpless, he or she naturally looks to a parent for comfort. But how can a parent, often overwhelmed by similar feelings, offer solace? Little Tree provides a place to which both parent and child can turn for help. 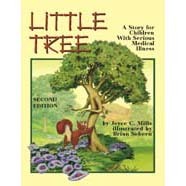 Sensitively written and charmingly illustrated, Little Tree brings to life a healing metaphor so powerful that its message of inspiration will be remembered long after the book is closed. "When I was four years old, I was badly burned and spent a long time in the hospital...Had such a book been offered to me when I was a child, I know I would not have suffered the emotional scars I have carried from that experience." --Violet Oaklander, Ph.D. Child & Adolescent Psychotherapist, Santa Barbara, CA. "Let Little Tree help you help the child who is coping with illness...and don't be surprised if you too feel its soothing, soulful message." --Arnold H. Zukow, M.D. Former Chief of Pediatrics Tarzana Medical Center, CA.